For thirteen consecutive years, the Pawtucket Arts Festival has been uniting Rhode Islanders in a late summer celebration of artistic, culinary, and musical talent. Events scheduled for the 2011 festival include an ongoing film festival, theatrical performances by the Gamm Theatre, the Lil Rhody Rib Fest, a photography contest, a Greek Festival, the Dragon Boat Races and Taiwan Day Festival, and the RI Philharmonic "Pops in the Park". 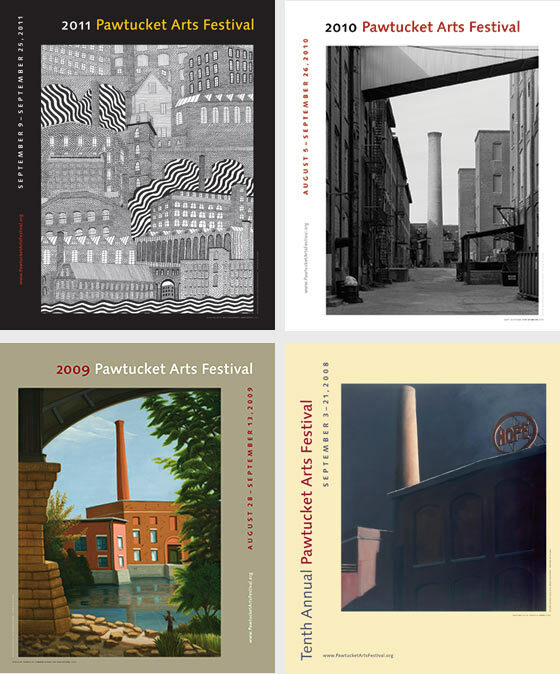 For the complete listing of events, visit the website for the Pawtucket Arts Festival. The festival's date are from August 19 through September 25. For the fourth year in a row, the City of Pawtucket asked Malcolm Grear Designers to design a limited edition print/poster in honor of the event. This year's poster is an ink drawing by Alan Metnick titled “Mill Buildings.” Last year's poster featured Matt Kierstead's photograph titled “City Interior.” In previous years, the poster featured paintings by artist Penelope Manzella, titled "Summer Along the Blackstone," and Gretchen Dow Simpson, titled “Hope.” The prints, signed and numbered by the artists, were printed by IOLabs on archival fine art paper. For a complete listing of events for the festival, visit the festival's website. Also available is a review of Alan Metnick's artwork and more information about the poster. GoLocalProv provides a stunning review of the entire poster series and information about how to obtain one of these collectible posters.